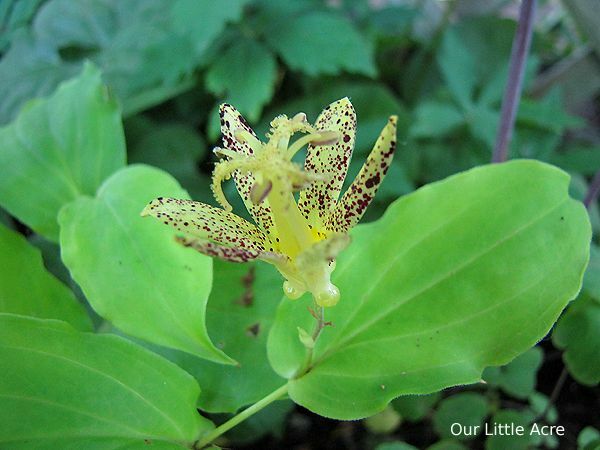 Our Little Acre: A Toad Lily? NOW? 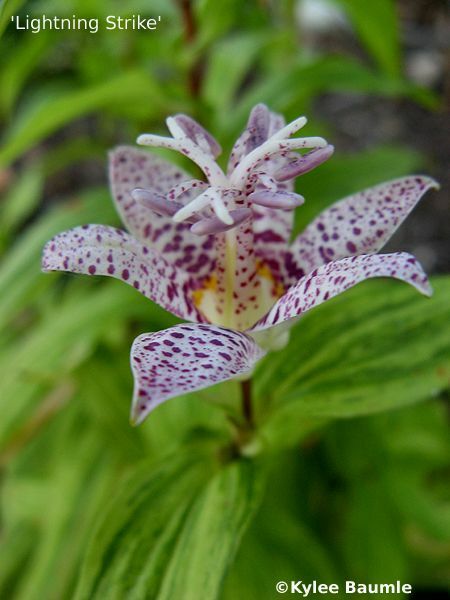 One of my favorite plants is the Tricyrtis species, otherwise known as toad lilies. They bloom late in the season, they've got interesting foliage and blooms, and they provide something a little out of the ordinary in the shade garden. I love them for different reasons - some have striped foliage ('Lightning Strike'), some have a golden edge on the foliage ('Samurai'), some have amazing soft colors ('Tojen') - but all have the one characteristic that first drew me in. Their blooms resemble small orchids. Normally, I have to wait until late summer and early fall to enjoy their flowers, but this hasn't been a normal year by any stretch of the imagination. "April flowers bring May showers" was spring's theme. And the normal lovely perfect temperature that makes spring so enjoyable was replaced by summer-like degrees in the 80s and even 90s. Perhaps that's why this week, my Tricyrtis latifolia 'Golden Leopard' is in bloom. It's normally a little earlier than the rest, but never has it bloomed in the middle of June. Not even close. It will be interesting to see what it does the rest of the summer, which officially began this morning. It will also be interesting to see if the other toad lilies bloom earlier than usual, too. I'm guessing they will, just as 'Golden Leopard' has and many other plants in the garden have since our early and warm spring began. I also have a large clump of toad lily. I will have to check to look for blooms as I wouldn't even think of them blooming until at least August. This does make you wonder what is going to happen next. I hope that everything isn't going to be fried. This is such a weird year. My dark-foliaged bugbanes have formed bud stalks already, and they normally don't bloom until October. Makes you wonder what will be left to bloom in fall. Oh, I love all of your beautiful lillies. They are all so pretty. Cannot even decide which one I like best! They are beautiful, but are you wondering if our gardens will "finish" early this year and we'll be left with nothing in the fall? Too much is blooming now that would ordinarily wait until mid-July for me. Lisa ~ I sure hope not. But it's definitely been a much warmer spring. Brooke ~ I love trying to capture all the gorgeous details that flowers have when you look at them up close! Thank you! MMD ~ I know. I'm thinking the same thing. I wonder if we'll have some rebloom of things that normally don't? Weekend Cowgirl ~ They're all unique, aren't they? Cameron ~ It's the same here, Cameron. I wonder if we'll just have extended bloom periods for those perennials that bloom all summer long with the fall bloomers finishing before their usual time. Beautiful. 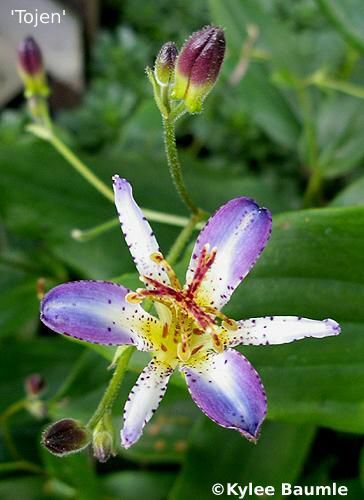 I ordered some this year, but didn't receive any (long sad story), so I'm again going to seek out some Tricyrtis for my garden. I love that about gardening, that every year is different. Kyle it is eerie to have flowers blooming well before they should. My Sumac tree is way ahead of schedule too and developed its "horns" much too early .. as with other plants .. my gorgeous Helenium .. I don't know what is going on but it is truly unnerving me too ! I have two varieties of Toadlily and so fard no buds or blooms just good foliage .. Love your Golden Lepard girl ! Garden Lily ~ You know, you're right...it's all part of the challenge of gardening that most of us love. It keeps things from getting boring! Joy ~ I've got a couple of Sumacs and I've never paid close enough attention to them to know if mine are early or late. It's interesting, isn't it, how we have "calendars" for so many things in our lives? I have a soft spot for Toad Lilies but now I'm really drooling - that Golden Leopard is AMAZING. Another one to put on the Must Have list. June blooms are outrageous for this plant. In my old zone 9 garden the plants would only have formed by this point. Certainly no buds. Marguerite ~ It's the same here. I've never had blooms this early. I've got asters blooming, too. (The ones I forgot to cut back until July 4th, like my mums.) Just a strange, strange year!